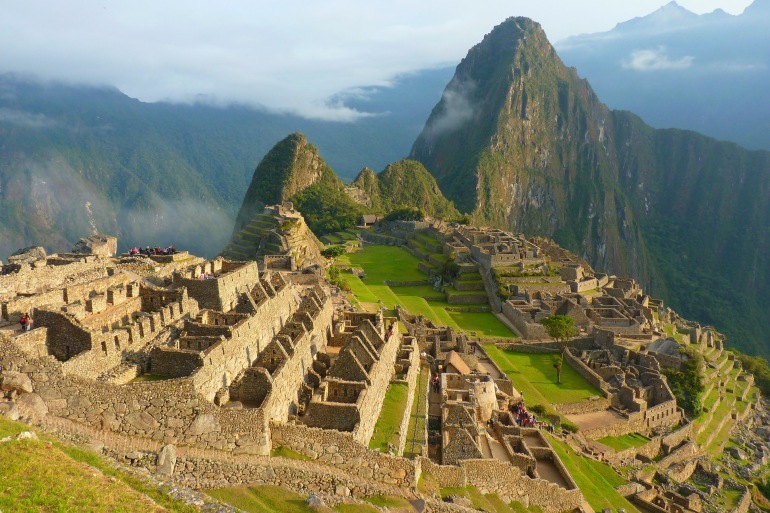 Share the mystery and wonder of Machu Picchu on a family adventure that includes kayaking on a lake high in the Andes, feeding alpacas and llamas, playing a traditional game with local children and swimming with sea lions. Arrive in Lima this evening and transfer to your hotel. Founded in 1535 by Spanish conquistador Francisco Pizzaro, this “City of Kings” is a mélange of colonial structures, pre-Columbian sites and modern conveniences. Fly to Cusco and enjoy lunch at a local restaurant offering Novo Andino cuisine, before driving to Urubamba in the Sacred Valley of the Incas. Visit members of the camelid family (llamas, alpacas, guanacos and vichunas) and learn about the fabrics made from their shaggy coats using ancient weaving techniques. Meet with locals wearing their colorful traditional clothing and learn from your guide how it differs between communities. Receive a lesson in the Quechuan language. Tonight, join the chef at your hotel for a Chef’s Table experience, as he demonstrates the preparation of a variety of Peruvian dishes. Prepare for a unique Sacred Valley adventure on the drive to Huaypo, a beautiful lagoon perched in the Andes. Admire the view of the mountains as you paddle around the lagoon in sea kayaks — a ride that reveals the natural beauty of Peru. Enjoy an outdoor picnic on the banks of Huaypo. Join an A&K Young Explorers Guide on a visit to a local house in the town of Maras. Learn how to play the traditional Sapo game and experience Peruvian home life in this remote Andean village. Enjoy leisure time at the hotel and a fun family pizza night with stargazing (weather permitting). When school is in session, visit the Kuychi Center to meet the underprivileged children at Niños del Arco Iris (Children of the Rainbow), a project supported by A&K Philanthropy. Explore the fortress of Ollantaytambo, a formidable structure of massive stone terraces that hug the mountain slopes. Next, journey deep into the Andes toward Machu Picchu aboard the glass-topped Vistadome train, gazing out at the spectacular Peruvian countryside passing by. Discover this breathtaking Incan citadel, following an expert guide who paces the trek for young explorers. Imagine those who once dwelled here and marvel at their stonework. Rise early to see Machu Picchu at sunrise or choose from guided hikes to the Inti Punku (Sun Gate) or to Huayna Picchu. After lunch, return to Cusco. Discover Cusco, visiting the Cathedral on the Plaza de Armas and the Santo Domingo Temple, a Dominican church built on the foundations of the Koricancha, the Incas’ principal religious building. Later, explore Sacsayhuaman, a stunning testament to Incan architectural skill. Compiled of massive stones, the largest of which may weigh as much as 200 tons, its walls were cut and placed together with incredible precision and without a single drop of mortar. Later, visit San Pedro market, and then spend your afternoon at leisure. This evening, dine at one of the city’s finest local restaurants. Fly to Lima and check in to your hotel. Tour the city, starting with the grid-like Plaza Mayor. View the marvelous, historic Cathedral and the colorful guards before the Presidential Palace, followed by a visit to the Church of San Francisco. Continue with a journey into the past, exploring Casa Aliaga, Lima’s oldest colonial mansion. Later drive to modern Lima to see pre-Incan ceramics at the Larco Herrera Museum, with special activities for younger guests. Set out on an excursion to Palomino Island, a huge sea lion rookery. Wearing wetsuits and life vests, jump into the water and share the ocean with these friendly animals. After an afternoon at leisure, see the impressive Huaca Pucllana archaeological site before a farewell dinner of contemporary Peruvian cuisine at the on-site restaurant. This morning, transfer to the airport and depart.